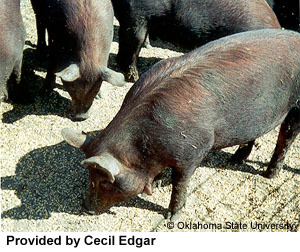 The hogs came from New Caledonia, which is a French Island in the South Pacific by Australia. They were to New Orleans in the late 1700's by the French. The breed was a lean meat type and the flavor excellent. The Red Wattle has never been very popular, years ago people wanted pigs for their lard, of which the Red Wattle had very little. The breed got some interest in the 1980’s for it’s reputation for a lean carcass. They sold for a high price and many people were breeding them. This unfortunately didn’t last too long. The meat is still good, and it is a gentle natured hog. They are easy to work and farrow. The Red Wattle is one of the so called tasselled pig and looks something like a Duroc or perhaps a Tamworth/Duroc cross, but with a pair of wattles (influenced by a single gene) hanging from the neck. The Red Wattle was quite a stable breed but has at least three different registries in the United States and is also recorded in the Canadian Swine Registry - it is not clear which of these record the original breed, or whether populations with nothing in comon except the wattling gene are included regardless of other characteristics.